I've been debating both this subject and the really bizarre looking Rs.IV for some time as subjects for scale rc models. In both cases, they are likely unmodeled, or at least very seldom modeled subjects. Aesthetically, the Gs is a more pleasing subject with fewer complications in building. I managed to find a number of photos recently which are priceless, but any additional drawings/info could be of use. I've done this type of build before with my Loening XSL2 modeled here, but it is a much easier subject with simple surfaces. Well I managed to get a start on this project, and since getting started is always the hardest part, I guess it's all downhill from here. Somehow I'm not sure if that is quite the case with this one, but at least I have something to look at now and scratch hairs over. I'll start a thread in the r/c forum here soon. Other than the stamp, there is no color info on this plane that I have found. I'm hoping that someone here may have some insight on the colors used on this vintage plane. 1. The orange-brown color on the postage stamp may likely be doped linen, which will turn a shade of orange brown over time. 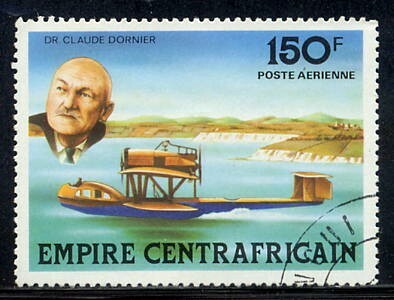 If the orange-brown color is correct, I still question if the entire plane would be that color, other than the blue hull bottom shown in the postage stamp. 2. Given that the entire airframe other than the hull bottom is not orange-brown as shown in the postage stamp, would the remaining non-fabric covered areas of the airframe be painted a grey-blue shade common of that era? 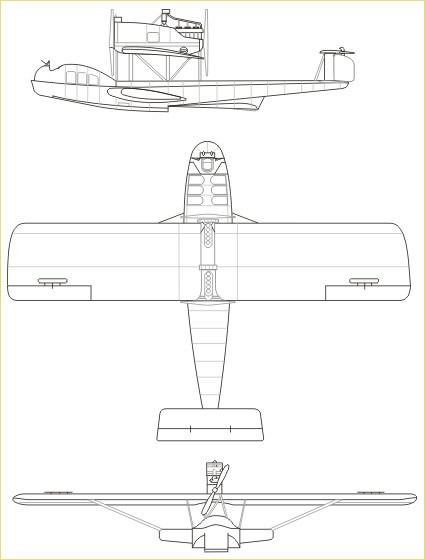 These areas would include the flat vertical sides of the rear hull behind the sponsons, the airframe hull top surface, and the engine cover panels. 3. The dark hull bottom can be seen in b/w photos, which agrees with the stamp in the area in front of the sponsons. Behind the sponsons, the upper hull (flat sides) is a lighter color documented in b/w photos, and is not the dark blue bottom color. I would think that color could be a grey-blue, used on seaplanes of that time? 4. The canopy of the plane appears to be reflective and bright in photos. Is the canopy aluminum or painted in a reflective aluminum color? Irregardless, it does not appear to the the same shade as the remaining top surface of the airframe. 5. Throwing a wrench into possible color schemes, is that the airplane may have been re-painted in areas during its tenure. A Russian website shows the plane with red rudders and "CH" markings on them. The white CH markings do not appear in all photos, and were added at some point. I have a suspicion that the red rudders in this drawing were an assumption made, as I have seen at least one early German seaplane that has a red rudder with the CH marking. As for the project, it's moving along well and there is a build thread on the RC forum here at Seaplanes UK. Bill, the Red rudder with "CH" markings was used on Swiss aircraft. The Orange color may well be correct and the upper fuselage may have been painted Aluminum to reflect heat. I would venture that the wing (and other fabric covered surfaces such as the horizontal tail planes) was overall Aluminum dope as that was the standard of the day. Wings (especially) and tail surfaces were normally doped Aluminum to reflect heat and slow UV degradation of the fabric. Fabric covered fuselages were usually painted since loss of fabric strength was a little less critical in that area. MrWidgeon wrote: Bill, the Red rudder with "CH" markings was used on Swiss aircraft. I imagine the CH marking had something to do with the Germans trying to avoid allied commission regulations. Maybe the rudders were painted red with the CH marking, if that was the standard that Swiss planes used. I guess it's possible the wings were not initially coated with aluminum dope, but were then later coated. Some photos appear to show a lighter color, where others are darker, but it's difficult to tell with the old photos. I guess that may just be a matter of choice, if I care to break up the color scheme a bit. The aluminum coating would make sense, as the very similar Wals built soon afterward are often represented with that overall finish. I haven't found info on the upper fuse deck construction, but I would assume it is likely doped linen covered wood. The scale models of similar Wals and the RS seaplanes of the era at the Dornier museum are finished in an overall aluminum color, which if correct would indicate that this plane was overall aluminum color. The more I look at photos, I believe you are correct about this. The plane was apparently painted, likely when the Swiss Ad Astra firm acquired it. This is one of those subjects where one has to decide what frame in time they are modeling. I decided to go with the red CH marked rudders, and aluminum upper fuse and flying surfaces. As for the hull, the bottom and partial sides are black (likely bituminous) and the upper sides are grey, along with the motor tower. Ad Astra may have painted the upper fuse sides black at some time, but I went with the "two tone" scheme shown clearly in photos. I imagine that I will make "Ad Astra" lettering for the canopy front, but the text underneath it may be impossible to locate. I wasn't sure how the shade of grey selected would look with the black on the fuse bottom and the silver, but it seems to have the vintage appeal that I was looking for. All things considered, I'm satisfied with the overall color scheme. Now to get this in the air, with a number of other yet unflown seaplane models. More photos on the RC Models forum here, as well as these few below.